An original letter of correspondence between Joshua Coffin Chase and Isleworth Packing House Superintendent Corbett Hutchinson. Topics discussed in the letter include how to pack third-grade oranges, what price to charge for said fruit, and instructions for picking operations. 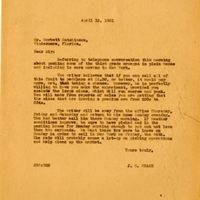 Original letter from Joshua Coffin Chase to Corbett Hutchinson, April 15, 1931: box 49, folder 20.91, Chase Collection (MS 14), Special and Area Studies Collections, George A. Smathers Libraries, University of Florida, Gainesville, Florida. Digital reproduction of original letter from Joshua Coffin Chase to Corbett Hutchinson, April 15, 1931. Referring to the telephone conversation this morning about packing some of the third grade oranges in plain boxes and including in cars moving to New York. The writer believes that if you can sell all of this fruit to peddlers at $1.50, or better, it would pay more, net, than taking a chance. However, he is perfectly willing to have you make the experiment, provided you exclude the large sizes, which will run coarse and punk. You will note from reports of sales you are getting that the sizes that are drawing a premium are from 200s to 324s. The writer will be away from the office Thursday, Friday and Saturday and return to his home Sunday evening. You had better call him there Monday morning. If weather conditions improve, be sure to have picked and in the packing house for Monday morning enough to put out not less than two carloads. We want these two cars to leave on Monday in order to sell in New York on Friday, the 24th. The rain will probably cause a let-up on picking operations and help clean up the market. Chase, Joshua Coffin. 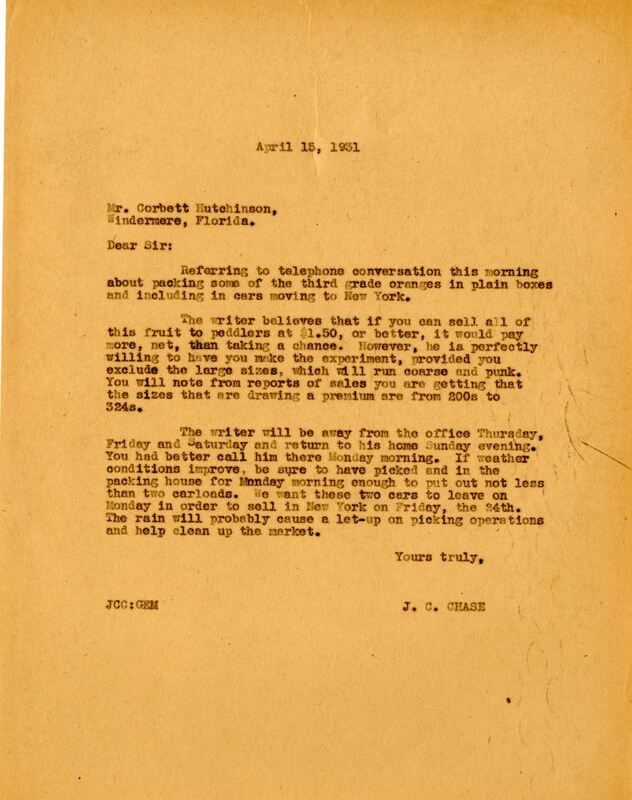 “Letter from Joshua Coffin Chase to Corbett Hutchinson (April 15, 1931).” RICHES of Central Florida accessed April 25, 2019, https://richesmi.cah.ucf.edu/omeka/items/show/2771.